The definition of an ALPCA Hall of Famer is one who unselfishly gives his time, energy and knowledge to others in advancing the hobby without seeking praise or reward. Conrad Hughson is the epitome of the definition. He has collected license plates for more than fifty years and has been a dedicated member of ALPCA since 1960. Originally from Massachusetts, Conrad relocated to Putney, Vermont in the mid 1970's. His collection is the best in number, quality and uniqueness. His gentle persona radiates throughout the plate collecting fraternity. Will Rogers opined that he never met a man he didn't like. Conrad is that kind of man. Puzzled by an odd plate? Ask Conrad. He'll know and he'll cheerfully give you the answer. That's just the kind of man he is. He worked in Boston as a bank auditor and took on a similar role when he moved to Vermont. He has attended almost every National convention including more than thirty in a row. He hosted the convention at Greenfield, Massachusetts in 1967 and was Treasurer of the club from 1974 to 1977. He took on that office when the club was broke and in disarray. He turned the office around at no cost to the membership. Conrad also served as Director and Vice President of the club. His other interests include antique cars, porcelain signs and antiques in general. Seeing the wisdom of being an ex-banker he formed his own business "Self Help Services". The business provides assistance to the elderly in the areas of estate planning, financial guidance and disposition of assets. It has expanded to an area of consignment sales of antique collections including license plates. No one in the history of the club has earned more respect than this quiet unassuming gentleman from New England. His personal collection ranks in the top three as one of the best and most extensive ever assembled. Conrad and his lovely wife Carol continue to reside in southern Vermont. 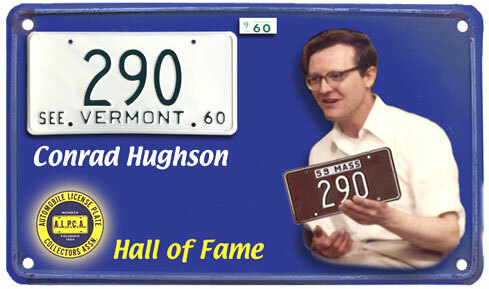 ALPCA is proud to welcome Conrad Hughson to the Hall of Fame.